Triangle are the principal contractor for the JCT contract at Parkside Court, carrying out the design, supply and installation of the fire sprinkler system and associated builders work to the flats and the communal areas. Triangle began on site on 3rd February. The priority for the first week was to set up site, build relationships with the tenants and conduct a full site survey. On Monday morning the cabin for the office and store was delivered and set up, along with a generator and portaloo. There were a few teething problems including the excessive winds blowing the portaloo over, and the generator failing to start each morning, fortunately these issues have now been resolved. Once Triangle’s site office and welfare facilities were set up the next task was to begin to build relationships with the tenants. Letters were delivered to introduce the company, detailing the work to be undertaken, and explaining the facts and myths surrounding fire sprinklers. Triangle met 2 particularly friendly tenants who allowed access to their flats for measuring and planning, this helped greatly with the site survey. Triangle’s site manager is responsible for liaising with the tenants regarding access to their properties, and is the main point of contact for any queries that they have. On day two a start was made on drilling the holes in the riser cupboard to run pipework from the riser to the tank room. The £5000 investment in a core drill and accessories was well worth it, as was the free training provided by Hilti. Towards the end of the week work began on the communal corridors, which involved cutting some frighteningly sized holes in the existing suspended ceilings. 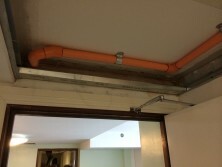 This is to gain access to the ceiling void in order to run pipework. 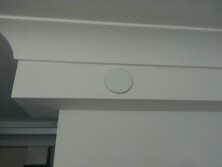 Once completed, these holes will be filled with access hatches, allowing easy access for any future works required. Triangle commenced work on 6 flats, beginning with installing the sprinkler system. In hindsight starting this many flats was probably not the best way forward as with the remedial works involved (installation of suspended ceiling, boxing in of pipework etc) a lot of flats were started but none completed. This week has been very much a learning process, thank you to the tenants on the first few floors for their co-operation and patience. Triangle had their first meeting on site with CHP and the consultant for a progress update. All parties are extremely delighted at this stage. Triangle discovered in the first few weeks that the remedial works were going to take a lot longer than originally anticipated, subsequently the decision was made to hire Lee, a qualified painter and decorator. Lee has been taken on full time and once this project is complete, he will be trained in-house as a sprinkler engineer. The engineers are installing the pipework into each flat in approximately 4 hours. 15 flats have been completed so far. Tenants working hours and holidays means we can often be working on around 5 floors at any one time. The main corridor works of installing the pipework and sprinkler heads has begun. In addition to hiring a new member of staff Triangle have dedicated extra fire sprinkler engineers to site over these last few weeks, with some days having 10 members of staff on site. The project deadline of 31st March is approaching quickly and Triangle are well on track to achieve this goal. Once again, Triangle would like to thank the residents for their support and help towards the smooth running of this project. 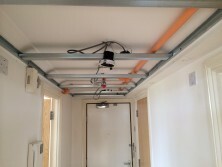 It’s the final push at Parkside Court to complete and commission the fire sprinkler system by the end of the month. A team meeting was held yesterday chaired by Triangle’s Commercial Director, Steve Chantler. All members of the team were asked for their input and suggestions to help towards meeting this extremely difficult target. To help make this happen Triangle have sprinker engineers putting up metal frame ceilings, plaster board and rubbing down ready for paint. There has been an incredible response from all the team in working towards this goal. And what an achievement it will be! 53 lived in flats and 14 corridors fully protected with a fire sprinkler system complete with newly installed hallway ceilings and low energy down lights, all completed in just 2 month. During installation Triangle were required to cut access hatches throughout the communal hallways ceilings for our pipework. 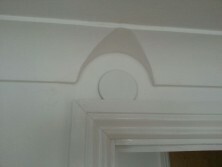 To ensure a high standard of finish Triangle chose to also repaint all communal hallway ceilings. 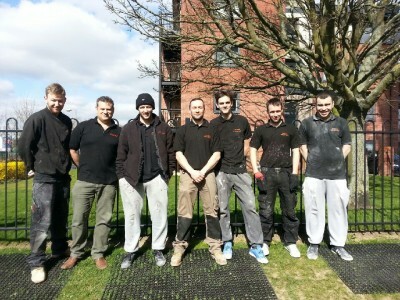 Extra staff were required on site to help with the painting in this final week. The sprinkler and Redcare systems were fully commissioned and despite the tight deadline the project was completed on time. One of the biggest challenges of a project of this nature is access to the flats, as an incentive every tenant that allowed easy access was offered the opportunity to enter a prize draw to win a 42 inch colour television. All tenants qualified and the prize draw should take place in two weeks. On 13th May, Steve Chantler from Triangle Fire Systems met with members from CHP and Essex County Fire & Rescue to officially mark the completion of the project. The prize draw for the television took place and ECFRS handed over the £50,000 cheque to CHP. 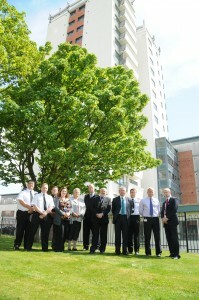 This is the first building to benefit from the match funding launched scheme launched by ECFRs last year. For more information see link below. Following successful completion of this project we have been awarded two further retrofit contracts, one of which is King Charles Court, part of the Southwark feasibility study that we helped to conduct in October/November last year and which will be part of 20 similar projects that we are undertaking for Southwark Council.